Faith. Life. Family. Cats. And Chocolate. Always Chocolate! 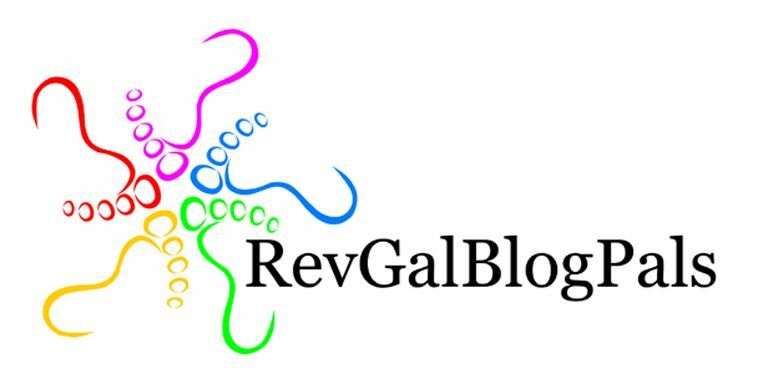 This week’s Friday Five from RevGalBlogPals is all about food! Thanks to 3dogmom for this week’s prompt! My first ever Friday Five is dedicated to Nikki MacDonald, sister RevGal, who was hungering for an opportunity to write about Haggis. With that introduction, today’s FF is all about food! 1) Is there a food from a foreign land whose reputation led to trepidation when you had a chance to give it a try? Did you find the courage to sample it anyway? If so, were you pleasantly surprised or did you endorse the less than favorable reputation that preceded it? 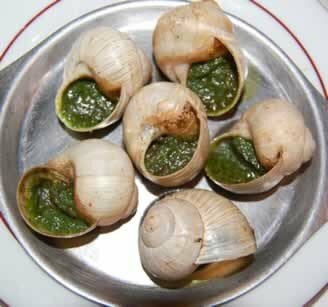 When I was in France for a short mission trip, I had the opportunity to try escargot. I was, quite honestly, skeptical. The descriptions I had heard ranged from “it’s like thick snot” to “chewy garlic.” So… I tried them. And they were DELICIOUS! Garlicky, warm, melt-in-your-mouth… oh my. I haven’t tried them since, because, well, I’m not convinced they would be good. Somehow, a restaurant that sells burgers, chicken fingers and fries should not be trusted to get escargot correctly. But maybe that’s just my foodie prejudice showing! 2) What food from your own country/culture gets a bad rap? As an American, you can get just about any kind of bread, and most of the time if it’s not mass-produced yeasty white bread, it’s pretty good. So I’ll come to the defense of German bread! A lot of people have only tried the dark brown German bread that has the consistency of cardboard with a tough crust. Mmmm. Delicious. Not. I have had scrumptious rolls, buns, breads and pastries during trips to Germany. 3) Of what food are you fond that others find distasteful? I. LOVE. RHUBARB. I like to make it into sauce and have it cold over yogurt or just plain. And I also LOVE ELDERBERRIES! When I lived in Ohio, they were growing along the back roads (usually around a lot of poison ivy!) They are a tiny, dark berry that you usually see in August. They don’t cultivate well, and I haven’t found a local source, other than frozen ones from Trader Joe’s. Elderberries are the slighty dusky, earthy-tasting relative of blueberries but pack a whole lot more flavor. I usually put them into a pie. Yummy!!! A third food that I enjoy and the Skepto-meter is high in my house is COCONUT. Yup. I can buy a package of Almond Joy bars and they will last me months. No one will touch them but me. Heh. 4) Is there a country’s food, not native to you, that you go out of your way to eat? A good peanut chicken pad thai over rice noodles. I’m cheap. I can enjoy it at a fast food place or a nice Thai restaurant. 5) What is your guilty pleasure food? Can there be anything but CHOCOLATE? BONUS: What was your most memorable meal (good or bad), either because of the menu, the occasion, the company, or some other circumstance that makes it stand out? The year we remodeled our kitchen, I was without an oven and cook-top for 4 months. Because of some issues with the County code inspector (not our contractor) the grand reveal was delayed into the middle of December. It was disheartening. Our architect/remodeler gave us a gift certificate to a local upscale restaurant. 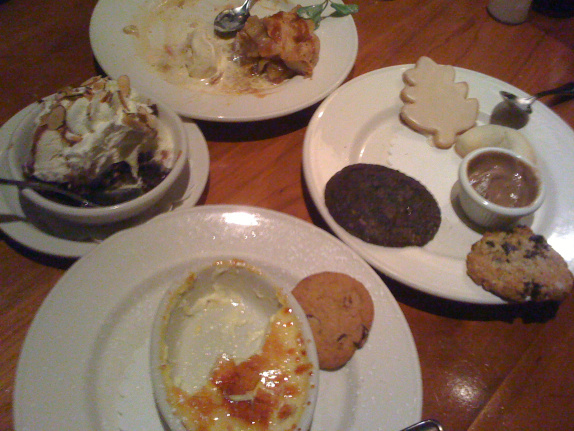 When we realized that we could use it Thanksgiving week, we celebrated with our daughters (one just home from college) and had some of the best cookies, pie, cheesecake and crème brûlée EVAR. As you can see we didn’t exactly wait to get a nice fancy picture… we dug right in! I live in a part of the world and an area of my own country where most of us do not struggle to put food on the table. I am blessed beyond measure to have all I need and, indeed, all I could really want, in terms of creature comforts and amenities. While I’ve just written a blog post that focuses on the excesses and loves of my palate, I realized that I needed to stop and count my blessings. So I am… If you are looking for a ministry to support in your area, I encourage you to help your local Food Bank or community soup kitchens. And to truly be thankful to God for that next meal. we pray now simply for the hungry hungry. no one goes hungry, no one lacks daily bread. those with food weep for the hungry, even if it makes them feel guilty. that you long for the hungry to be fed. that you long for them to feed the hungry. loved with the same love, both in need of you and each other. God of the Hungry, so many are hungry. until all feast with Jesus in the new age. In the name of Jesus and the hungry hungry we pray. End of sermon. Thanks be to God. Great play, and thank you for the prayer. The very fact that we have so many choices when it comes to eating is an absolute indulgence. And, your post inspires me to give escargot a try sometime when the opportunity presents itself. Love that you ended with a prayer–beautiful. Fun to read your responses and love the prayer. great post – and a good reminder about blessings to be thankful for. Loved the prayer.